From the drawing stage to completion we have the expertise to get your signage project completed. Forget the middle man and their low quality products, go with the best and forget the rest!!! Wholesale Signs Fabricators is a full-service sign company located in Orlando, FL. We are a registered electrical sign contractor & manufacturer approved by Underwriters Laboratories (UL). We are a leading wholesale sign company capable of getting your project complete from start to finish. We are entrusted to know all procedures of documenting for permitting applications with complete knowledge of local ordinances and their requirements. We offer a complete signage solution from permitting to fabrication and finally the installation. We have the skills and know how to take the project from drawing stage to fabrication, assembly & Installation. We are committed to providing our customers with the satisfaction they deserve when choosing Wholesale Sign Fabricators as their signage provider. We provide assistance and support to business owners, other local and national sign companies in the development of their signage projects. We can help them with permitting, fabrication and installation. Whether you are looking for small or big signage, our experienced personnel can help you make the best decision based off your interest. Starting with a site survey through final inspections you have a sign company you can depend on to get the job done. We take pride in delivering quality products with excellent service at a competitive price. Thank you for visiting us online! We look forward to providing you with quality workmanship and exceptional customer service. Our commitment is to support our customers with our expertise, making their search for a sign a successful one. We look forward towards you ultimately choosing us as the sign company you do business with. We believe our high quality products, workmanship and exceptional customer service are our best qualities. As a UL Listed Manufacturer you can rest assure that quality is always our highest priority. As Electrical Sign Contractors we possess the knowledge and the qualifications to get the job done right. WSF signs is bonded and Insured. You can have the most extensive inventory, knowledgeable employees and a foolproof advertising plan, but without clientele – your success will be implausible. That’s where we come in. Our signs, made from the highest quality materials, will aid your business in attracting the positive attention that it needs to flourish. No project is too extensive for us to take on, and we adhere to the utmost standards of workmanship and quality, assuring complete customer satisfaction 100% of the time. From grand openings to special events, we’ve got your signage needs covered. Banner signs are a popular option amongst customers and a valuable asset to any business, whether you’re a seasoned company with years of experience or just beginning to navigate the waters. These advertising powerhouses, curated specifically to cater to your individual marketing needs, can help drive traffic to your business. This is especially beneficial if your brick-and-mortar store is in a not-so-ideal location, or if you have an important message you need to get out to the public. Other common uses for banner signs include tradeshows, sporting events, company events, birthdays, and anniversaries, to name a few. Take your advertising on the road with you! If you are looking to extend your branding onto a fleet of vehicles, magnetic signs are your best option. From images to sizing, our products are fully customizable and help increase awareness and visibility of your brand. Our magnetic signs are simple to apply and even easier to remove, if need be. Designed to deliver a potent message to the masses, this type of signage is built to withstand the harshest of conditions, including rain, fading, and wind. 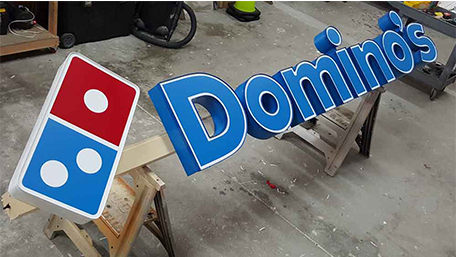 Channel letters, which are often illuminated and/or three-dimensional, offer a clean, visible display for your brand. These are typically the first thing a person notices when they arrive at your business or are driving by, so it’s imperative you hire a company who will go above and beyond to create a stunning finished product. Channel letters are affordable, eco-friendly, and can be installed relatively quickly, depending on the magnitude of the product. If you’re in the market for high quality, attractive signage for your business – you’ve come to the right place. Our in-house production plant allows us to provide fabrication, permitting, and installation services all under one roof. We offer affordable package solutions and are fully committed to providing our customers with the satisfaction they deserve, from start to finish. Wholesale Sign Fabricators is a company that you can trust. Remember: If you can dream it, we can do it. Give us a call today at 407-442-SIGN to discuss your ideas and find out what we can do for your business! We value you as a customer, but we also understand your demands. At the end of the day it's your complete satisfaction that allows us to stay above our competitors. Our success is based on the gratification of our customers.